Pam Liberda is the executive chef at Waldo Thai Place, where she curated a menu filled with regional Thai dishes. In the back of Waldo Thai Place on Wornall Road, behind a metal gray door, oil sizzles with the aroma of frying meat. 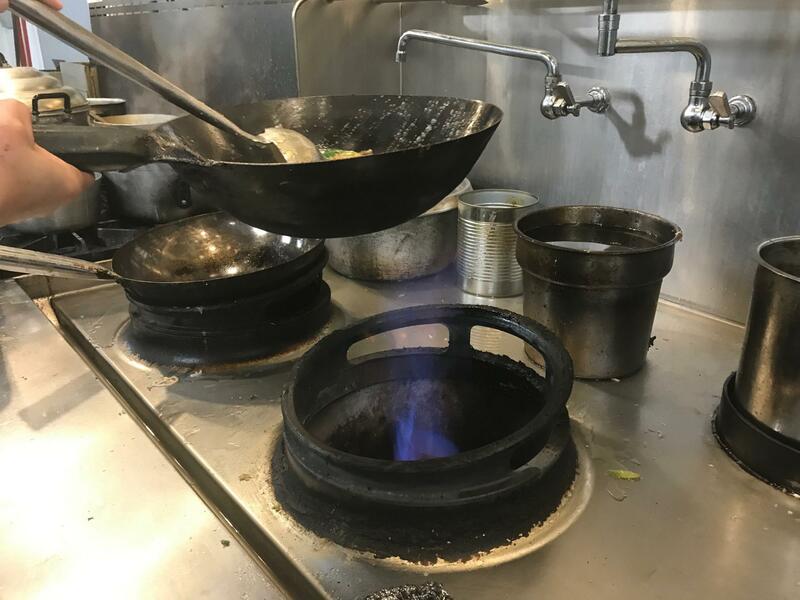 Near the back of the kitchen and taking command over a line of large, hot woks is executive chef Pam Liberda. Liberda and her husband Ted opened Waldo Thai Place last summer after closing down Thai Place in Westport in 2015. Since then, Waldo Thai Place has garnered attention from food critics and lovers for offering a selection of regional Thai dishes that stand out from others in the Kansas City area. Liberda curated the menu at Waldo Thai Place and chose her favorite dishes because she wants the customer to feel that love through her food. One example: pad kee mao. It only takes Liberda about five minutes to make in the kitchen. Using a wok and high heat, she throws together egg; flank steak; yellow onion; and an assortment of vegetables like Chinese broccoli and Thai basil. Bringing the dish together are the kee mao noodles, which are a type of rice noodle. 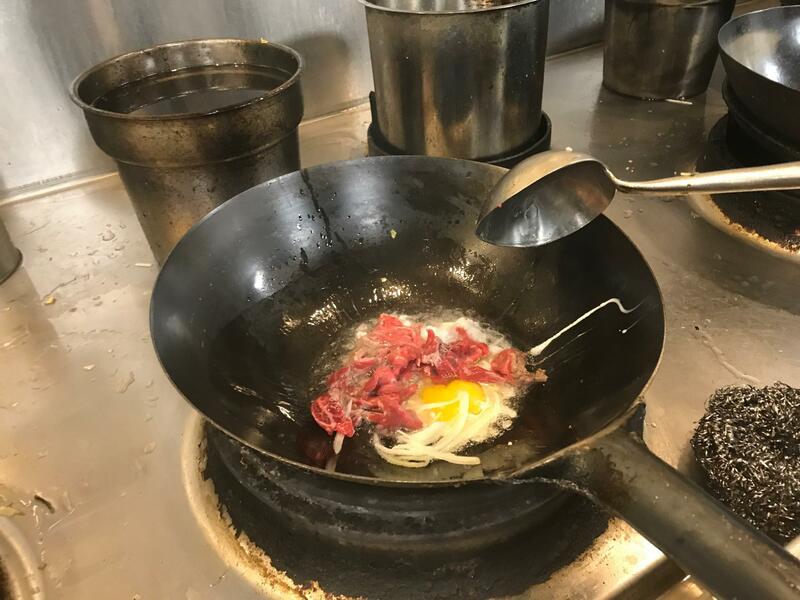 The first ingredients Liberda puts in the wok are flank steak, an egg and yellow onions. “We use a fresh noodle instead of the dry noodle, and we soak it overnight,” Liberda said. Pad kee mao is notable for its spice, which it gets from serrano pepper and Thai chili pepper. 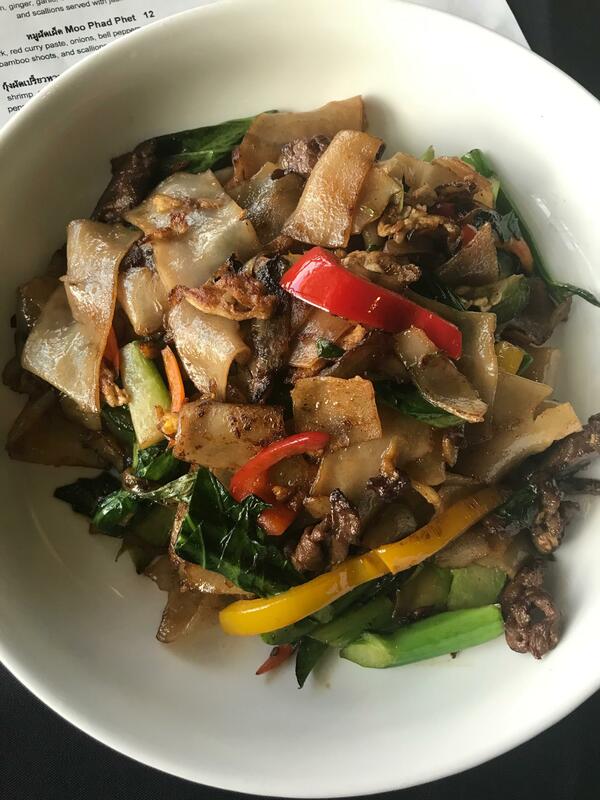 The dish is also popularly known as “drunken noodles,” as “kee mao” in Thai translates to “drunk.” Liberda says there’s a story behind pad kee mao involving a drunk guy going out to his garden and grabbing all the vegetables he can find. To finish off the dish, Liberda adds black soy sauce, sugar and white pepper. She says the wok and the intense heat of the flame brings all the flavors together. “After you understand the heat and you learn how to manage the heat — the fire — then you understand the whole process of cooking, and actually our kind of food,” she says. Growing up in the small town of Lamphun in northern Thailand, Liberda loved the traditional food her family cooked. But she quickly learned that cooking was not something she should seriously pursue. Liberda cooks the pad kee mao over an intense flame to bring the flavors together. There is a secondary cultural component at work, too — the idea that many older Asian parents push practicality over passion when it comes to a career. For Liberda, this translated into studying nursing at a university in Thailand and then working as a nurse, first in the EMT ward and then in the operating room assisting surgeons. Liberda immigrated to the United States on October 23, 1998, a national holiday in Thailand commemorating King Chulalongkorn, one of the kings of Siam. Liberda’s move to the U.S. came with a case of culture shock — she quickly realized that if she wanted to continue eating her favorite Thai dishes, she would need to learn how to make them herself. To help recreate traditional Thai food, Liberda says she relied on her memory. “You remember in your mind, in your palette, like, ‘Oh, yes, I want my food to taste like this,’” she says. Pad kee mao is one of the noodle dishes Liberda makes at Waldo Thai Place. Liberda married Ted Liberda after taking a job at a local Thai restaurant in Kansas City. She said getting married to a restaurant owner further pushed her into the professional cooking world. After jumping into the restaurant business with Ted, Liberda says she helped her husband run the restaurant by becoming a jack-of-all-trades — from working the front of the house to filling in for cooks if they were out sick. Liberda says she further improved her cooking skills when she worked at the international wing of the Cerner Innovations Center for a year and a half. In that position, Liberda made food for about 500 people at a time. She says working there helped build her confidence as a cook. It’s been a long time since Liberda worked as a nurse in the EMT ward, but Liberda says she thinks she’s found her passion in life. She loves that she can cook the dishes she cherished growing up — and she knows she’s good at it, too. Celisa Calacal is an intern at KCUR 89.3. You can reach her at @celisa_mia. This winter finds Kansas City well-stocked with fresh soups, including specialties from around the world. Whether you are craving old-fashioned beef stew, classic French onion or spicier options, your quest will be short and rewarding in a city saturated with soup offerings. Segment 1: Mark Twain's love letter to American cuisine. Samuel Clemens, AKA Mark Twain, was an avid writer and traveler. He was also a champion of America's regional foods. While homesick in Europe, he wrote an extensive list of the foods he missed, like prairie hen and peach cobbler. On this episode, we speak with the author who's been following in Twain's culinary footsteps, first for a book in 2011, and now for a podcast. Located just a few hundred feet away from The Olive Cafe restaurant in south Kansas City is an unassuming, medium-sized warehouse — the Olive Cafe’s bakery. Filled with a number of strange machines, the bakery serves a singular purpose: making pita bread. Salah Mansi is the owner of the Olive Cafe and has been overseeing the daily operations of the bakery since its opening in 2003.